Once upon a time –not quite “in the beginning,” but not too long after– a snake had a question. He sauntered up and posed it quite politely, and if you’d been there you’d have agreed that both his posture and his manners were impeccable. As she listened, Mom found herself already staring hard at the tree, and it had long since begun to seem good, true, and beautiful to her. If you’d been there you’d have agreed. Ask Adam: he was there, and he agreed. In fact, for a while he claimed eating it had been his idea to begin with, but later on his story changed. Together they took the bait, gobbled it down, and in licking their lips they signed up for Team Snake. Years later, in marriage counseling, Adam and Eve would look back on that furtive picnic as the last thing they really did together. They stayed married, of course, but it seemed like a lie, just keeping up appearances for the sake of the kids. 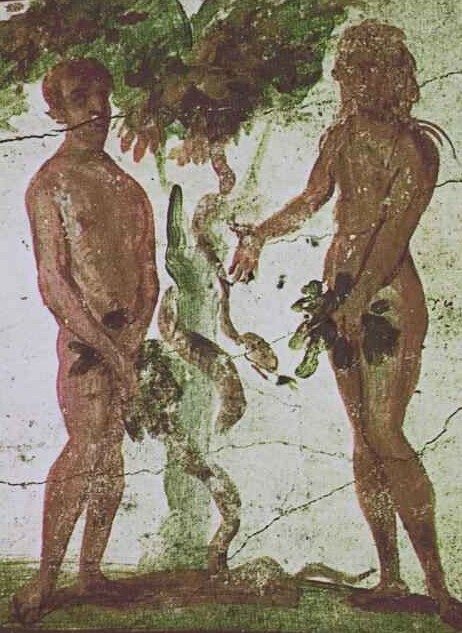 Somebody had to raise Cain, and Eve was glad to point out that that was one thing Adam was good at. They set up house together in a gated community way out east of Eden, but life was hard now, things were thorny, and something had obviously come between them. They both had long commutes in opposite directions, and traffic was always slow going both ways, which (as Adam regularly pointed out, rather too loudly) didn’t even make sense because people were a new idea back then. Regrets? They had a few. “Maybe we bit off more than we could chew,” offered Eve. “Maybe we had too many pets,” admitted Adam. They never really broke up, but they definitely grew apart. Everything grew apart now, because it seemed like in this new world they’d made, everything that rises must diverge. Mainly they grew apart from God and tried to give the impression that they’d never really been that close to begin with. They tried having him over to the house a few times, but things were awkward. He didn’t really have what you’d call the gift of small talk. But another nickname was “Old Thunderbear,” and another was “He Who Shouts and Promises,” and another was “Judgey Judge.” They had lots of nicknames for him, because Adam had a real knack for making up names. In fact, they had so many nicknames for him that they ended up forgetting his real name. “Yeah, the Big Guy,” Adam said, looking out the bay window to see what the kids were up to in the far corner of the backyard. “Can’t live with him, can’t live without him,” he laughed. Eve laughed too, but it was the very death of mirth.